Prayers are distributed via our online prayer request form to both our Friends in Prayer Chain and Grace for Today newsletter. PLEASE NOTE: By submitting a prayer online you are indicating you have obtained permission to share and print names of all persons involved. Please obtain this permission BEFORE submitting a prayer, or choose word your prayer request without naming individual names. Grace Lutheran’s Friends in Prayer Online Prayer Chain has teams of devoted pray-ers who dedicate themselves to praying for the needs of our community. Your prayer request will be forwarded on to our pray-ers just as it is typed, so be as specific as you like. Prayers may also be submitted for printing in Grace’s worship folders and newsletter, Grace for Today. NOTE: PRAYERS SUBMITTED TO THE CHURCH NEWSLETTER WILL APPEAR IN PRINT AND ON OUR CHURCH WEBSITE. PLEASE MAKE SURE YOU HAVE PERMISSION TO LIST A PERSON’S NAME IN PRINT AND ON THE WEB. A prayer labyrinth is an ancient tool for reflection on one’s life and spiritual journey. It is an active way of praying because it forces a person to use their whole self (mind, body, and spirit) in prayer, inviting the use of imagination, intuition, and creativity. A labyrinth introduces the idea of a wide and generous path to God, one that is horizontal instead of vertical. 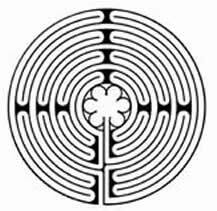 It is hoped that walking the labyrinth may bring peace, comfort, clarity, relief from stress, a sense of closeness to God, and new insights and perspectives on problems or questions in your life. For my Eagle Scout project, I proposed to build a prayer labyrinth for Grace Lutheran Church. In order to explain this project and receive approval, I met with the Church Council, the Spirituality Task Force, and members of the Property Committee. It was decided that the best place for the labyrinth was southeast of the gazebo in the outdoor worship area. The labyrinth is patterned after a famous one built into the floor at Chartres Cathedral in France around 1200 A.D. It is unicursal, which means that there is one path that leads into the center of the labyrinth and the same path leads back out. It is about 50 feet in diameter with a five foot center. Outlined in about 1,600 bricks, the inside path will be grass that will be planted in the spring. The bricks are at grade level so that the entire areas can be easily mowed and maintained. Also during the spring, two plaques will be added to the labyrinth. The first plaque will be at the entrance of the labyrinth and it quotes Psalms 46:10 “Be still and know that I am God.” The second plaque will be in the middle of the labyrinth and read Philippians 4:6 “Don’t worry about anything; instead, pray about everything. Tell God what you need and thank him for all He has done.” While some work remains and will be completed in the spring, it is generally visible as you drive down the main driveway. As you prepare to walk the labyrinth, take time to relax and become calm. Ask yourself a question that you can reflect on as you walk. Walk slowly and in silence. Walk with a phrase or a question in your heart and your mind. To help you focus on your journey, take time to reflect about where you are in your life. —As you start, you may want to focus on a problem or question in your life, and then let it go as you journey through the labyrinth. —The path to the center may be viewed as a time of letting go of the things that are separating you from God. —The time spent in the center may be a time of special closeness with God. The path outward may be a time of enjoying a special union with God as He accompanies you back into the world. —You may want to slowly repeat a sacred word or phrase to focus your mind on your purpose. Always ask God for what you need from this time of prayer. I hope that this new addition to our church grounds will be a place of quiet and prayer for the members of our congregation and our community.